Sign up for Summer by Earth Day, and we will plant a tree for you in the Intervale! To celebrate Earth Day, we are partnering with Intervale Conservation Nursery to plant a tree for ALL members who sign up for an Intervale Food Hub Summer subscription by April 22nd! Not only will you be supporting Vermont farmers and enjoying fresh, healthy food all summer - you'll also help keep Vermont's land and waterways healthy. Simply place your order online by Friday, April 22nd, and we will take care of the rest. Remember, you can choose to pay in monthly installments - you do not need to pay in full for the season up front. The Intervale Conservation Nursery plants trees to protect Vermont's land and water quality - which are essential elements in producing good food. These trees will be planted in the land between the Intervale farm fields and the Winooski River, to improve the quality of our working land and waterways. Your tree will be planted this fall. 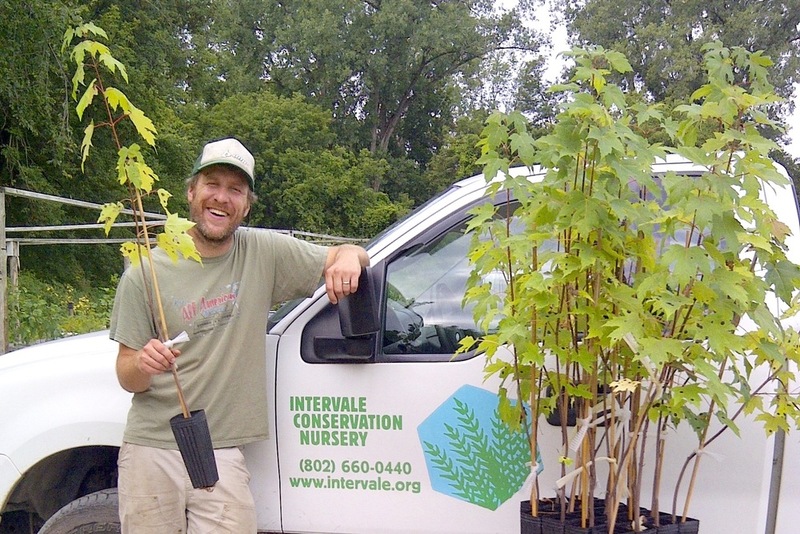 You can volunteer with the Intervale Conservation Nursery to plant your tree, come take a walk along the trails in the Intervale to watch it grow, and see firsthand all the great work happening at the Intervale Center! The Intervale Conservation Nursery will be planting trees to improve the riparian buffer in the Intervale. A riparian buffer is the term used to refer to the space surrounding a stream or a body of water. Riparian buffers contain native grasses, flowers, shrubs, and trees, and when they're healthy and properly functioning, they protect the quality of the waterway. Riparian buffers prevent pollution, soil, and extra nutrients from entering the stream. Overhanging trees keep water temperatures cool and prevent evaporation. Native plants also provide habitat, food, and safe traveling routes for wildlife. Healthy riparian buffers also slow down floodwaters and rain runoff. In the fall, Intervale Conservation Nursery staff and volunteers will be starting a multi-year riparian buffer enhancement project along the Winooski river. We will be planting native trees and shrubs that have been grown at the Intervale specifically for conservation and restoration work. Some of the species include Red Maple, Shrub Willow, Black Willow, Dogwood, Cottonwood, Hackberry and more. The area of focus is along the Northern reaches of the Intervale, amongst agricultural land that's currently leased out to some of the organic farmers growing food in the Intervale. The Intervale Center's goal for this project is to continue to carefully steward our land in the Intervale. By enhancing the existing riparian buffer, we will be combating erosion and soil runoff, we will improve wildlife habitat, and we will improve the water quality benefits and the overall functions of a healthy riparian buffer. On top of creating a living, functioning buffer for our lands, our goal is to bring the community through our beautiful landscape and witness all the great things happening down here. THANK YOU for supporting the Intervale Food Hub, and in turn, supporting the greater Intervale Center community. Together, we are making the world a better place. Intervale Food Hub and Intervale Conservation Nursery are enterprises of the Intervale Center. Good Food Comes From Good Farmers and Food Makers!